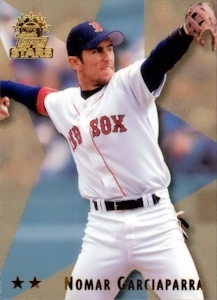 ON THIS DATE (May 10, 1999) ... Nomar Garciaparra has owned a Red Sox uniform for 982 days. But for all he already has done that seems touched by myth, the 25-year-old Garciaparra did something last night he had never done before. On a night that must have sent even 80-year-old Ted Williams to dancing, his reconstructed hip be damned, Garciaparra hit three home runs, including two grand slams, and drove in 10 runs in a 12-4 win over the pitching-deficient Seattle Mariners, equaling a raft of records while enjoying a night he never thought possible. Garciaparra became the fourth Sox player, and first since outfielder Fred Lynn on June 18, 1975, to have 10 RBIs in a game. The others were first basemen Norm Zauchin (1955) and Rudy York (1946). He is the first Sox player to hit two grand slams in a game at Fenway Park, joining third baseman Jim Tabor (1939) who hit two in Philadelphia and Rudy York (’46) who did it in St. Louis. Garciaparra etched his name in history on the first pitch to him from Seattle rookie Eric Weaver with the bases loaded in the eighth inning, driving a ball through a 14 mile-per-hour northwest wind into the left-field screen. Garciaparra’s first two home runs of the night came off another rookie righthander, Brett Hinchliffe, who was brought up from the minors for just this occasion but did nothing to ease the pain of a staff that has the worst earned run average in the major leagues (6.54). The Sox shortstop hit a grand slam into the visitors’ bullpen in the first inning and followed that two innings later with a two-run home run just inside the Pesky Pole. The home runs gave Garciaparra five in a stretch of 21 at-bats, and powered the Red Sox to their fifth straight win and eighth against the Mariners in their last nine games here. Not only was it the first three-homer game of his career, but it was the first multi-homer game by a Sox player this season.